A mix of the Traditional and the New. 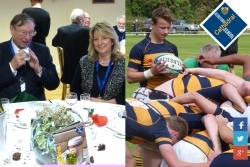 The ever popular OH day has grown again and this year saw the introduction of Football to the sporting programme, plus the option of a hot meal at Wyeside after the sporting fixtures. OH of all ages enjoyed the day.